Supports over 140 image file formats, with 70+ image editing operations, filters, and effects! PDF Conversion Software - Convert to PDF and from PDF with Ease! 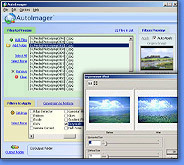 The AutoImager software features a powerful PDF converter feature that can convert PDF to AWD, BMP, DCX, DICOM, EPS, EXIF, FAX, FPX, GIF, IOCA, JBIG, JPG, MODCA, PCX, PNG, PSD, SCT, SGI, TIFF, TGA, WFX, WPG, and more! The software can also convert any of these formats (and many more) to PDF just as easily. Conversion can be performed in batch mode, either via an easy to use interface or extensive command-line support. Multi-page PDF files are fully supported by the PDF converter software. AutoImager can also edit PDF files, such as auto-trim, deskew, flip, mirror, rotate, shear, hole punch remove, border remove, line remove, dot remove, invert, despeckle, and much more...all in batch mode (of course, you can also process only one PDF file if desired). The software's PDF conversion process is very fast and easy to use. Advanced options are available for those who want to take advantage of them, though they are completely optional, making AutoImager the perfect PDF converter software for users of any experience level. 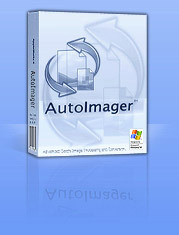 Click here for more information on AutoImager and its PDF conversion features or download your copy now. Copyright © 2001-2007, Mystik Media. All rights reserved.